In John 3:8 Jesus says, “The wind blows wherever it pleases. You hear its sound, but you cannot tell where it comes from or where it is going. So it is with everyone born of the Spirit.” We presented our plan for the mission in Haiti before the elders of Park Plaza Christian Church in Joplin, Missouri at our ordination in 1974. It consisted of five areas of ministry: evangelism, education, healthcare, book translation and nutrition. We were dreaming, but God was serious. Today we are astonished at what God is doing. The mission had a very humble beginning that would lead to an incredible organization over the years. The front part of a 2 ½-room rented house in Port-au-Prince was where we held prayer meetings, Bible study and clinic. FAME financed the construction of a medical clinic to serve the surrounding area. Eventually, due to political disturbance, we had to shut down the medical activities there and in turn moved to enlarge the operation at Fonds-Parisien. In the meantime though, the church and school continued to grow rapidly. In 1999, we added the Institute of Translation and Interpretation that served students in Port-au-Prince and surrounding areas. We grew to impact thousands of people in Port-au-Prince over the next 40 years, but we did not stay confined to working only in the city for long. In 1977, I brought some folks to Fonds-Parisien where I preached the first message in a flea market. I spoke about God’s love for humankind. A witch doctor was sitting about 40 to 50 feet away from where I stood. After I spoke, he called to me and I went to him. He said, and I quote , “Today I hear someone speak about the love of God. When the evangelicals come here, they curse witch doctors out and insult them. We run them out with rocks.” But he listened when I spoke. That was the open door for us to start the work in that area. I called for my brother Thomas to come and lead the work in evangelism and education while Betty and I traveled there every week to lead mobile clinics. That was the basis of the evangelistic work that was to take place in Fonds-Parisien. This campus now contains a church, a hospital (that will soon be expanded), a school, a woodworking shop, a peanut butter factory, a youth center, a large guesthouse for mission teams, and an apartment building. An orphanage is to be built soon. On top of these two main campuses, there are other campuses that include 57 churches and 12 sponsorship schools that operate under the auspices of the mission. Due to government regulations that require upgrades of buildings and higher pay for teachers, by next year the mission will have to reduce their number of schools due to our incapacity to meet a higher standard. The other areas where we are working are Simonette, La Croix Perisse, Thoman, Chapotin, Bois Galette, Maingrette, Bertrand, Fonds-Verrettes, Fonds- Cheval, Drouillard, Mais-Gaté, Primitive, L’Artibonite, Peredo, Nan Plaisir, Pays-Pourri, Nan Boulay, Beudet, Rue Tiremasse, and La Tremblay. 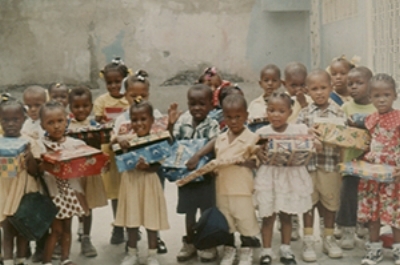 Haitian Christian Mission, implemented by its Haiti counterpart Eglise Chretienne des Rachetés d’Haïti, is represented by a permanent Board in the U.S., a CEO as liaison between the two countries, and representatives over the different aspects of the mission such as evangelism, education, healthcare, etc. The existence of this mission does not depend on one person or its directors. Peter says: “All men are like grass, and all their glory is like the flowers of the field; the grass withers and the flowers fall, but the word of the Lord stands forever.” (1 Pet. 1:24-25). The mission was founded on God’s word and it will remain thus until the end.